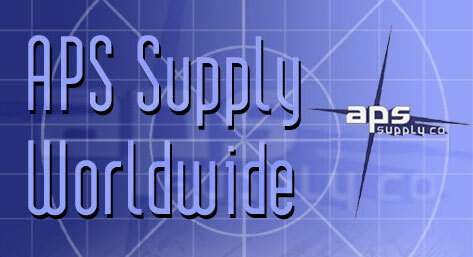 APS Supply Company has been serving the construction industry since 1980. APS Supply Company started as a construction equipment and supply company specializing in concrete and masonry accessories. The operation was expanded in 1984 when we began manufacturing expansion joints and related products for the concrete and masonry industry. APS Supply Company sells products such as concrete expansion joints self expanding cork joint fillers fiber expansion joint closed cell poly foam rubber expansion joints closed cell neoprene standard cork self expanding cork fiber board homex bearing pads aps cork concrete expansion joints sponge rubber sponge rubber expansion joint neoprene bearing pads. Cork Expansion Joint Filler is preformed from clean, granulated cork particles, bonded together with an insoluble phenolic resin and molded under heat and pressure. The resultant material is strong, light in weight, flexible, acid-resistant and waterproof. Cork will not extrude when compressed up to 50 percent of its original thickness, and regains up to 95 percent as joint expansion takes place. Cork Expansion Joint Filler is used for all types of concrete construction where the filler must be compatible with polymer-base sealants. Cork is widely used in commercial and industrial construction. Can be compressed without extrusion. Recovers to approximately 95% of original thickness after compression. Compatible with polymer-base joint sealants. APS currently has state approvals in most states for many of our manufactured products. Our products have been sold in every state in the country and we have well over 100 distributors nationwide. CRD-C-508 D-1751 Width: 2" - 48"
Thickness: 1/4", 3/8", 1/2", 3/4",1"
Length: 5', 10', 12' American made. Can be used for a wide variety of concrete construction projects such as highways, driveways, sidewalks or anywhere any expansion joint is required. Should be sealed with a hount sealant to protect it form weathering. D-994 Width: 2" - 36"
Thickness: 1/4", 1/2", 3/8", 1/2", 3/4",1"
Length: 5', 10' Composed of asphalt, vegetable fibers and mineral fillers; formed under heat and pressure between two asphalt asturated felt liners. Economical, waterproof, permanent, flexible and self sealing. Ideal for sidewalks, driveways and multi-level floors. 330* FOAM EXPANSION JOINT N/A N/A Width: 2" - 48"
Length: 5', 10' Provides an excellent joint filler and back up material for use in either horizontal or vertical applications where expansion and contraction movements must be accommodated. Should be sealed with a joint sealant to protect it from weathering. *MSDS Sheet for this product currently unavailable. We also do some exporting as well as importing. Our building with office and warehouse facilites and 3.5 acres of ground was purchased in 1986. 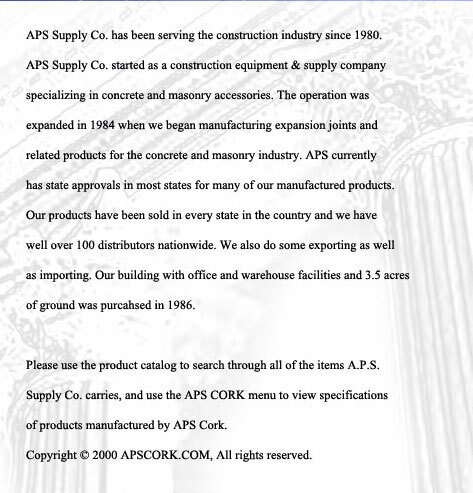 Please use the product catalog to search through all of the items APS Supply Company carries, and use the APS Cork menu to view specifications of products manufactured by APS Cork. A.P.S. Fiber Board is composed of asphalt impregnated fibers that are bonded together to produce a compressible, resilient, non-extruding concrete expansion Joint filler. It is readily compressible and will recover to more than 75% of its original thickness. A.P.S. Fiber Board is an ideal expansion Joint in highways, pavements, runways, sidewalks, and in all concrete or block structures. While offering excellent non-extrusion and recovery properties, A.P.S. Fiber Board should be protected from water infiltration and weathering with a suitable joint sealant. A.P.S. Fiber Board should be installed against the forms or other abutting structures, as detailed on the plans, before placing concrete. The filler should be installed 1/2" below the concrete surface and sealed with a high quality joint sealing compound to protect from water infiltration and weathering. However, a backer rod or bond breaker tape should be installed over the joint filler to prevent the sealant from bonding to the filler. A.P.S. Closed Cell Poly Foam is an expanded polyethelene, flexible foam expansion joint filler available in white or black. It is highly resistant to most solvents and chemicals. A.P.S. Closed Cell Poly Foam is light in weight and easy to use on the jobsite. A.P.S. Closed Cell Poly Foam can be used in any application requiring an expansion joint in concrete or masonry. Because of its flexibility, Closed Cell Poly Foam can easily be wrapped around columns as an isolation joint. A.P.S. Closed Cell Poly Foam makes an excellent sealant back-up material and cuts easily to size on the jobsite with a utility knife. Sheets: 3/4" x 48" x 108"
1" x 48" x 108"
Cut Material: Any width 2" - 48"
A.P.S. Closed Cell Poly Foam meets the requirements of A.S.T.M. D1752, Sections 3.1 through 3.4 with compression requirements modified.